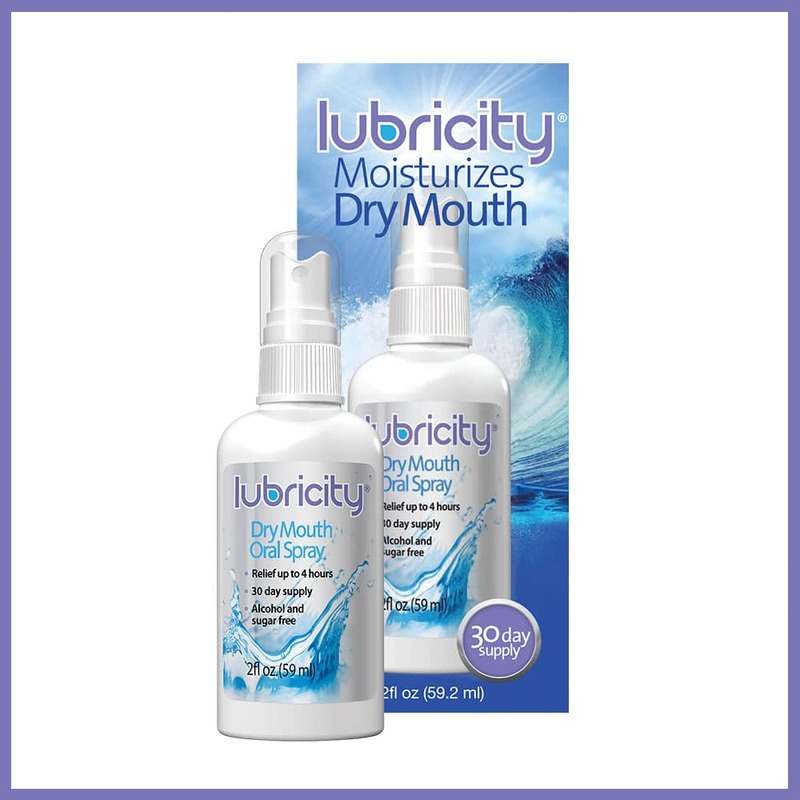 Lubricity’s innovative formula helps alleviate the symptoms of dry mouth for up to 4 hours! Lubricity is based on hyaluronic acid and works different from other products. It forms a flavorless gel film that coats the mouth and provides lasting relief from the most persistent dry mouth symptoms. 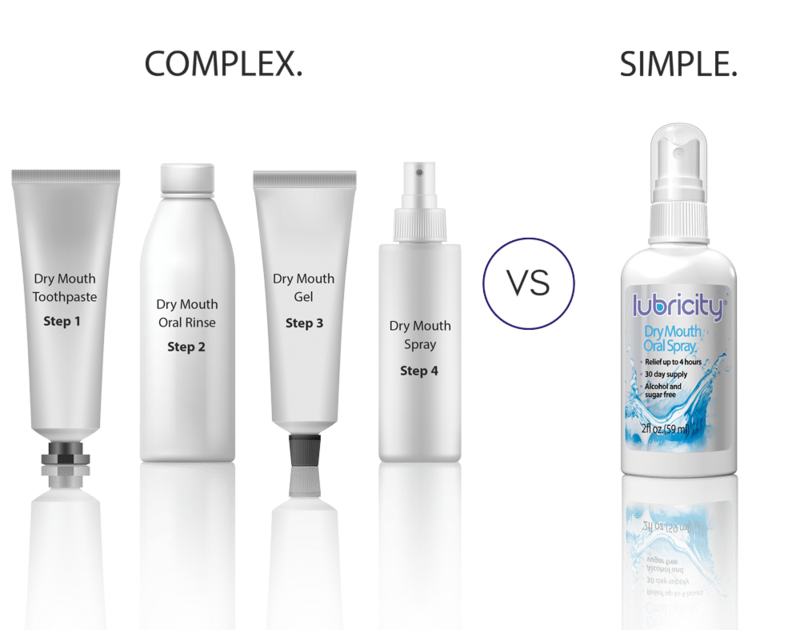 Lubricity is a flavorless, odorless solution that alleviates the symptoms of dry mouth. It provides a soothing, moist feeling for up to 4 hours per single use when applied as directed. Our formula has only five ingredients. The main one is hyaluronic acid (HA), known among scientists as “nature’s lubricant.” This ingredient is naturally produced in our bodies. It has a great ability to retain moisture and can be easily absorbed in the mouth. Lubricity also contains xylitol, which prevents bacterial growth in the mouth, reducing the risk of infections and formation of dental caries. Other ingredients include water, sodium benzoate, and potassium sorbate. The soothing and moisturizing effect lasts up to 4 hours when Lubricity is used as directed. Be sure to apply after meals, so the food you eat doesn't interfere with the solution. Lubricity's formula consists of only 5 GRAS-listed ingredients. They are: water, xylitol, hyaluronic acid, sodium benzoate, and potassium sorbate. Contains no sugar or saccharin, and is alcohol and sugar free. 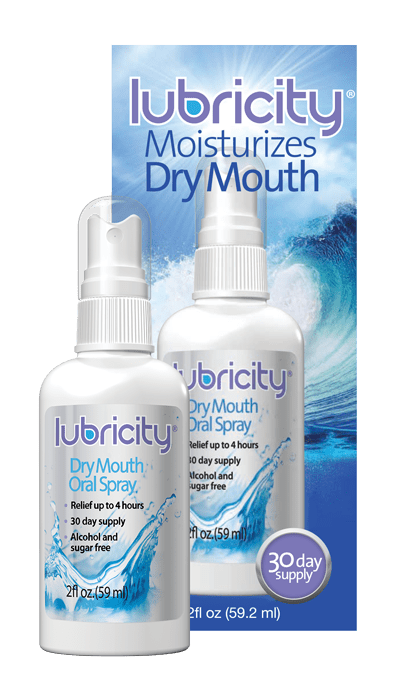 Lubricity's 2-oz bottle is designed to last for up to 30 days if the product is used as directed (Pump directly into your mouth 3-5 times per application. Use after meals and before bed). Lubricity has a gel-like texture and comes out in a stream rather than a mist. The spray cap is spill-proof and easy to use. The 2-oz bottle can be conveniently carried in a purse or a pocket, so you can use it whenever and wherever you need. There is no need to get special toothpaste, special mouthwash, a spray and a set of drops together. 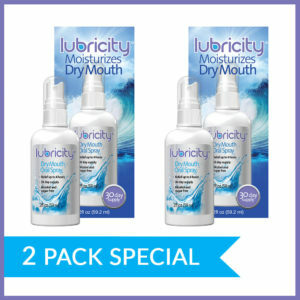 One bottle of Lubricity is all you need to effectively get rid of dry mouth. Despite seemingly higher initial cost, Lubricity actually is less expensive overall because you get more use out of each bottle. The effect of each application lasts up to 4 hours, and the 2 oz bottle is designed to last for 30 days if used as recommended. Use the code below or simply add it to cart right now! Use the code below or simply add it to the cart right now! Lubricity has provided relief from dry mouth to many people. Try it and see if it can help you too. Great moisturizer for dry mouth. Lubricity is a wonderful product. I have tried many moisturizers for dry mouth and this is by far the best I’ve had. Love it! Lubricity is wonderful! My favorite thing is that there no flavor, and it has the consistency of real saliva. 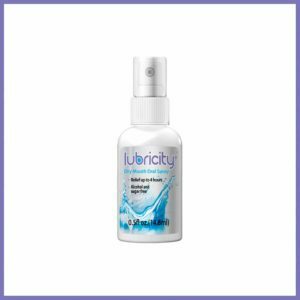 I have extreme dry mouth issue from Sjögren Syndrome and Lubricity is my new go to dry mouth spray! I have been using it for a couple of months and it really helps with dry mouth. Using it as directed keeps my mouth really moist especially at night. Join our mailing list and receive a 20% OFF coupon right away! As we always give discounts and exclusive deals to our subscribers, please keep in mind that this coupon may not work if used when other promotional offers and discounts apply.